The Alabama basketball team will play its first true road game of the season on Thursday when it travels to Orlando to play the UCF Knights (KenPom: 42). You may remember that a short-handed UCF team came to Tuscaloosa last season and left with a 65-62 win. Game time is 6:00 P.M. CT. The game will be televised on ESPNU. Our very own Bobbyjack will be at the game in person, and I'm sure will share all the sordid details after the game. My Two Cents: Alabama has a 5-1 record after playing a solid, not great, schedule. With the exception of a poor performance against Northeastern, this team has done what it's needed to do against the level of competition it's faced. It's also addressed some questions it faced in the preseason at the point guard position, and it appears that Avery has settled on a rotation, though I remain convinced the starting lineup featuring two bigs is not the best lineup for this team most nights. The next six games prior to conference play will be much tougher, beginning with this game against the preseason favorite in the America Athletic Conference (AAC). For Alabama to navigate these next six games successfully, they need to clean up some things. For starters, they have to take better care of the ball. Alabama's turnover percentage is currently 20.3%, meaning 20% of Alabama's possessions end in a turnover. That's bad by the way. They are currently ranked 228th at KenPom in turnover percentage. Alabama's opponents have a turnover percentage of 21.3%, which is in the top 100 at KenPom. Unfortunately, that number doesn't mean much when Bama is turning it over themselves almost as often. UCF doesn't turn the ball over much (16.4%), but they also don't turn their opponents over either (18.1% - the D1 average is 19.2%) so I expect turnovers will be a key stat in this game. If Bama can limit their turnovers, they'll have a chance to steal one on the road. 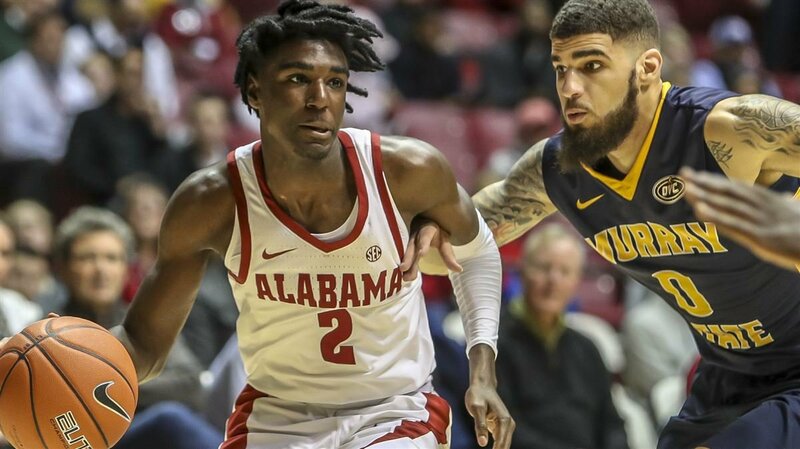 Players to Watch: Imagine if Kira Lewis doesn't reclassify to 2018 and enroll at Alabama this season. We could be talking about a 2-4 basketball team if he doesn't. Yes, in my opinion, he's had that kind of impact. While there are freshmen in the SEC that are getting more pub, I'm not convinced that there is another freshman in this league that has had as great of an impact for their team like Kira has had up to this point. He currently leads the team in scoring, and is tied for the lead in assists; but beyond that, he's been a great competitor, defender, doesn't make a lot of mistakes, and he seems very coachable. Oh yeah, he's also the best free throw shooter on the team at 87.5%. I'm sure the coaching staff wasn't expecting to have to lean on Kira for 30 minutes per game this early in the season, but he's thrived nonetheless. Thursday will be his first true road test so it will be interesting to see how he responds, but he has yet to flinch so I don't expect this will bother him at all. UCF's struggles a year ago had much to do with injuries to key players throughout the season. Aubrey Dawkins was perhaps the worst of those injuries. He suffered a preseason injury that kept him out for an entire season in which he was expected to be a major contributor. Dawkins was a top 100 recruit out of high school. He played a year at Michigan before transferring to UCF to play for his father (head coach Johnny Dawkins in case you hadn't pieced that together yet). His season averages so far: 15.2 ppg, 5.7 rpg, and 1.0 apg. Unfortunately for Bama, they can't focus on just Dawkins because UCF has multiple guys that can hurt them, but Dawkins versatility may present the most problems on both ends. Prediction: UCF was short-handed last season when they won in Tuscaloosa, arguably the most disappointing loss of the season for Alabama. This UCF team will not be short-handed as their star trio of B.J. Taylor, Aubrey Dawkins and Tacko Fall are not only healthy, but playing well (a combined 42.4 ppg). Assuming that UCF fans turn out for this game, Alabama will not only be facing a good team, but should also face a vocal crowd in their first road game. A win on Thursday could be a Q1 win for the resume in March, while a loss wouldn't sting too badly assuming UCF goes on to have a successful season. Alabama keeps it close, but falls short in Orlando.